For the shortbread crust, preheat the oven to 375 degrees F. Combine the flour, powdered sugar and salt in a bowl or in a food processor. Add the butter and cut in with a pastry blender (or process in the food processor) until the butter is in tiny pieces and the mixture is coarsely crumbled. Press the mixture evenly in the bottom of a 9X13-inch baking pan and bake for 10-12 minutes until lightly golden. Remove from the oven and let cool completely. For the lemon curd, in a medium saucepan, whisk together the cornstarch, 1/2 cup granulated sugar, water, fresh lemon juice and lemon zest. In a separate medium bowl, whisk together the egg yolks and 1/3 cup granulated sugar until well-combined and fluffy, 2-3 minutes. Add to the saucepan with the other ingredients and whisk to combine. Stirring constantly, bring the mixture to a boil over medium heat. Once bubbles pop at the surface and the mixture has thickened, remove from the heat and stir in the butter. Strain the mixture through a fine mesh strainer into a bowl. Remove about 2 cups of the mixture to a separate bowl, cover, and set aside to cool completely. To the remaining lemon curd, add the white chocolate and stir until melted. Let cool to room temperature. Add the cream cheese and whip with an electric mixer until light and fluffy. 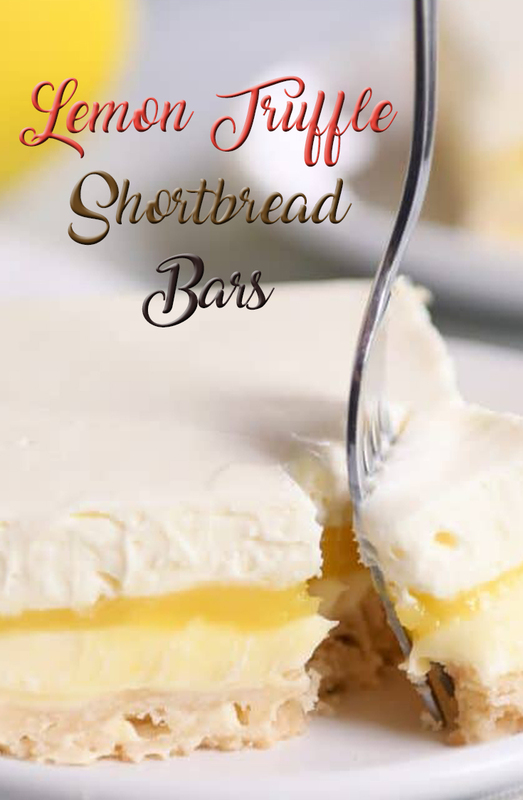 Remove 1 cup of the creamy mixture to another bowl, and spread the rest of the cream cheese mixture evenly on top of the shortbread crust. Combine the reserved 1 cup mixture and the whipping cream. Beat until thickened and soft peaks form that mostly hold their shape, 2-3 minutes. Spread the reserved 2 cups cooled lemon curd (with nothing added to it) on top of the cream cheese layer. It helps to dollop in large spoonfuls across the bars before spreading. Spread the whipped cream mixture on top of the lemon curd (again, dollop spoonfuls of it across the bars before spreading). Refrigerate the bars for at least an hour before cutting and serving (can be refrigerated 8-12 hours before serving).